Second placed side Woking are the visitors to Clarence Park this weekend as the Saints look to keep the pressure up on the sides in and around the play-off places. City suffered a late defeat last Saturday against Dartford, who grabbed all three points in the eighty-eighth minute when Phil Roberts lobbed the ball over Dean Snedker from the edge of the area. It was a painful defeat to take for Ian Allinson who had seen his side rally twice from a goal behind and have the better of the goal scoring opportunities in the second half . After the game he couldn’t hide his disappointment “We’ve comeback in the first half and shown some great character and for me we should have gone on to win the game. We tried to force things and we didn’t have to do that as we were in control and it allowed them (Dartford) back into the game”. However, the Saints did bounce back on Tuesday night as they overcame Royston Town 1-0 in the Herts Senior Cup to set up a semi-final tie against Bishop Stortford or Watford. Sam Merson’s heavily deflected strike just past the hour mark proved to be enough to secure City’s progression. 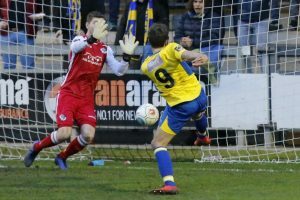 Saturday’s opponents have enjoyed a successful return to life at this level following relegation from the National League at the end of the 17/18 campaign, sitting just two points off of top spot with two games in hand on current league leaders Torquay United. Woking appointed former Hampton & Richmond Borough boss Alan Dowson in the summer and the forty-eight-year-old has led a revolution at Kingfield Stadium, bringing in the likes of Max Kretschmar from his former club Hampton & Richmond Borough, experienced striker Jake Hyde and the former Saints duo of Harvey Bradbury, on loan from Oxford United, and defender Ian Gayle. Gayle scored the winning goal against the Saints earlier this season at Kingfield, netting late on from close range to grab his first for the club. It was an entertaining clash that saw City take the lead with just ten minutes left on the clock following David Moyo’s spectacular curling effort, but Hyde levelled things up two minutes later before Gayle struck. The Cards are on an impressive run of form at the moment and are currently ten games unbeaten. They have won eight of those matches on the bounce and you have to go back to their 2-2 draw with Chippenham Town on the 3rd November for the last time that the Surrey based club dropped points. Kretschmar is currently leading the goal scoring charts for Woking with twelve goals in all competitions, eleven of which he has netted in the league. Both he and Hyde, who is a goal behind the midfielder, could be the danger men to keep quiet if the Saints are to pick up their first win over the Cards since 2009. 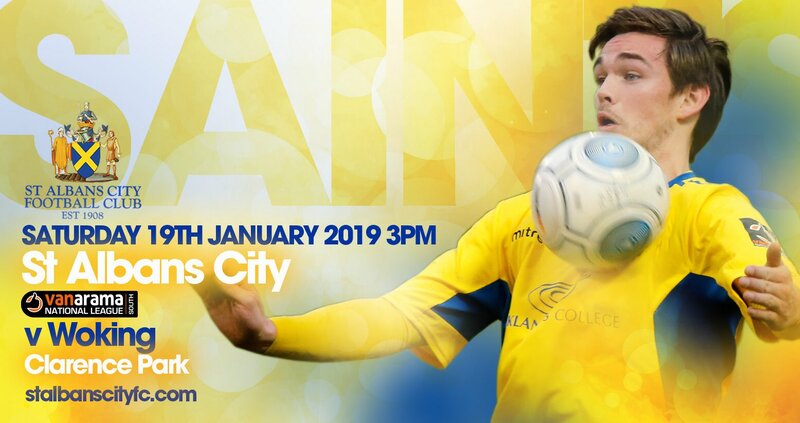 In terms of team news for the Saints both Ben Herd and David Noble continue to be doubts as they recover from the injuries picked up during the festive period. However, the rest of the squad should be available for selection going into Saturday’s clash.